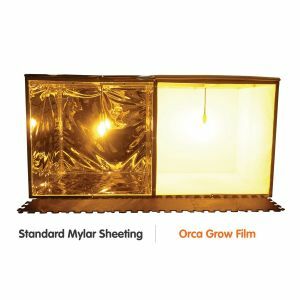 ORCA Grow Film provides a 99% full-spectrum diffuse reflectance with no color shift or iridescence so the light reflected from its surface maintains the original color spectrum/wavelength produced from your grow lamps! ORCA Grow Film is made from threads of a high-density reflective plastic which are bonded together to form a unique surface topography. The resulting geometry of the microfibers and the submicron pores within the microfiber create a highly reflective and diffuse surface. Its rough surface allows each individual ray of light to react with a different reflective orientation to spread the light at every concievable angle.